Will Trump win? Will Hillary win? No matter the outcome, it’s critical to anticipate the market’s reaction. See what this economist projects. 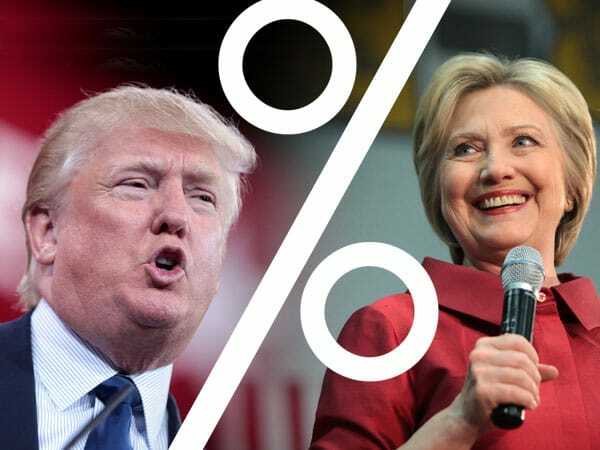 The chief economist of Citigroup, Willem Buiter, recently commented on how the Federal Reserve is likely to respond in the case of either a Trump presidency or a Clinton presidency, and what that could mean for the markets. The Fed’s approach to interest rates could vary greatly depending on which candidate clinches the White House, and Buiter says it’s imperative that Americans understand how this power shift could impact the economy. Interest rates have stayed at historic lows since the major crash of 2008-2009 that left the economy in a desolate recession. In fact, the Fed has only raised interest rates once since that historic downturn, and that was just a modest rate hike in late 2015. Right now, the outlook for near-term Fed rate strategy indicates the remote possibility of a miniscule rate hike before the end of the year, most likely in September before the presidential election. But what the Fed decides to do with interest rates after the election is a toss-up. Depending on who takes office, it could opt to continue raising rates slowly and gradually, or it could pull back and start slashing them again. Both scenarios could have serious impact on your retirement. Everything depends on who takes office in November. Unfortunately, there’s a downside for Americans’ savings accounts no matter what the Fed decides to do. However, knowing how the Fed is likely to react to each candidate could give you invaluable insight to protect your wealth. Although the Fed is supposed to be an apolitical entity, Buiter points out that the central bank is reading into the implications of both Clinton and Trump’s policies, and is likely formulating a general plan of reaction for either candidate’s entrance to the White House. Buiter’s assertion is that a Clinton presidency would influence a continuation of the Fed’s current plan to raise rates, and a Trump presidency would flip the script and make the Fed more likely to start slashing rates. On one hand, raising rates means Americans can worry a little less about inflation cutting into their retirement, but only if that increase in rates doesn’t warrant a negative reaction from the stock market. Nobody knows for sure how a rate hike will be received by the market, and it could trigger a temporary drop that would hit retirement accounts especially hard. Rate cuts present a similar conundrum. There’s benefit in the fact that lower rates typically stimulate economic growth and strengthen the market. But with creeping inflation and rates already sitting below 1%, further cuts could cripple returns on retirement accounts and eat away at the wealth of Americans. In the final analysis, the Fed is facing a Catch-22. Although there’s no way to escape the impact of higher rates under a Clinton presidency or lower rates under a Trump presidency – short of leaving the country altogether – the understanding of how Federal Reserve policy is set to shift gives you the priceless knowledge to create your own defense strategy after the November election. And of course, precious metals like gold can play a crucial role in such a defense. And, more timely than ever, gold has experienced yet another spike in prices just this week as the Fed continues to falter on rate policy, proving Americans are relying upon precious metals more than ever for security in uncertain times. Regardless of political and economic turmoil over the past several years, gold has continued to deliver both safety and respectable returns to those who have chosen to protect their savings with it. And, if a solid track record going back thousands of years can act as any indication, there’s little doubt it will continue to do so in the wake of whatever policy changes transpire after the election.